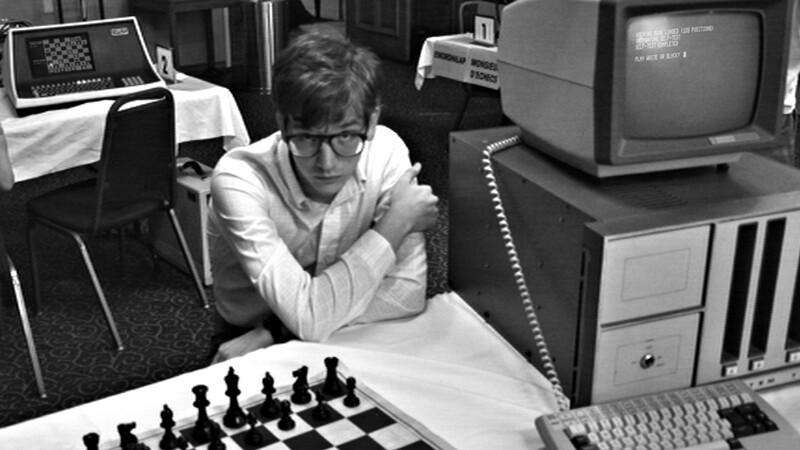 The overall setting of Computer Chess is a tournament between multiple technicians around the country who have gathered to a small hotel in the early 80s to compete their computer chess programs against each other. The characters (many of whom director Andrew Bujalski hired because of their knowledge of computer technology) are all high profile experts in their field who meet the ultimate classification of nerds (they wear brimmed glasses and uptight, formal clothing). Various subplots range from the expected (debugging software), the humorous (Michael Papageorge, an engineer played by Myles Paige, tries to find a place to sleep after discovering he doesn’t have a room), to the bizarre (a pack of cats is Computer Chess’ equivalent of the twins in The Shining). The character with the most central role is Peter Bishton (Patrick Riester), a nervous teenager who struggles with his sexual anxiety and reclusiveness. The documentary aspect is ditched partway through Computer Chess as we realize the director isn’t any bit concerned with his footage (he aims the camera at the son, damaging the filter, and is rarely seen shooting film). It’s at this part where Bujalski makes his film become more earnest about his subject matter. Yes, Computer Chess frequently mocks the seriousness the programmers take about their profession but there’s much respect for their work as well. The eccentricity and playfulness of Computer Chess, alongside the improvisation of the actors, keep the picture in consistent form. The ending, however, is far more serious and dramatic as it deals with the aftermath of the tournament, revealing that there’s far more to the programming than imaginable. I was confused by the abupt note of Computer Chess concludes with though after some thought appreciated and admired what Bujalski was trying. Computer Chess may be frustrating but I see it as a superb and intellectual comedy. Nice to read this review. I’m trying to muster up the excitement to see this one. Sounds like my hesitations should be tossed aside. Thanks! I know many people weren’t into this one but I really enjoyed it for what it’s worth. Good review. This is on my list. I’ll get to it soon enough. When I finally do, I hope I (mostly) like it as much as you do. Thanks! I saw it through Hulu. A lot of people didn’t like this, but for me it was pretty strong. Can’t say I’m going to rush to rent this one. Well written review, but I think I’ll pass for now. Thanks! I really like Computer Chess, but it’s understandable this isn’t for everyone. Nicely done man. Seen this crop up a couple of times and seems like a decent little watch. Thanks! It’s a polarizing picture, but I really enjoyed it. I’ve heard of this movie but I’ve never investigated further so I didn’t know what it was about. Sounds interesting, to say the least. Though the abrupt change in format sounds like it might be hard to bring off…? It does take the thin line between sic-fi and comedy. It’s not a movie for everyone but I really liked it. Wow. I wish I had seen the movie you saw. This was so unbelievably boring and unfocused, I couldn’t even finish it. Nice review though. Thanks! I know this is a polarizing movie but enjoyed the interesting ideas that came up on screen. Good review man. I didn’t get much out of this film though. I loved the 1980s setting and some of the characters were memorable, but honestly it just bored me to tears. Thanks! Some other people don’t me they haven’t liked it. I felt it was pretty strong how it conveyed it subjects and was really interested in the idea of artificial intelligence that appeared at the end. I’m not much into chess in general, I wonder if I would even *get* this movie, ahah. I’ve never been into chess either, but the movie deals more with the fascination of the game (or the be more precise, the computer programming of it). It’s a decisive movie, but I think it’s worth watching since it’s relatively short and is available on Hulu. Not much happens here, but it’s all pretty interesting to watch as you clearly care for these nerds, all that they have problems with and whether or not any of them are actually going to come out on top in this tournament. I shouldn’t have cared, but I did, and I think that’s where most of the movie’s charm lies. Good review. Thanks! Great point about the characters, we really do care about them. Great work man. Gotta catch this soon. Thanks! It’s a decisive picture but I was a fan. That first line is enough for me….you have sold me on watching it! What I had seen of it, it did not seem that appealing….